Blades of ice rising from the surface of Europa, Jupiter’s frozen moon, will likely pose major hazards for future space missions aiming to land on the satellite. When it comes to space exploration, few things are as exciting as Europa. Sure, the Earth’s moon or Mars spark our imagination, but Europa is much more likely to host life — beneath its frozen surface. Slightly smaller than Earth’s Moon, Europa is primarily made of silicate rock, but because it’s so far away from the Sun, its surface is completely frozen. Initially, astronomers didn’t give much attention to it, but the Galileo mission (launched in 1989) showed that there’s much more to Europa than meets the eye. Current models now show that heat from tidal flexing causes the subsurface to stay liquid, enabling the Jovian moon to host an ocean of liquid water, right beneath its surface. Since liquid water is crucial for life as we know it, this makes Europa a prime candidate — and to make things even better, astronomers provided strong evidence of water plume activity on Europa, suggesting that the ocean is interacting with the seafloor, having tectonic-like activity. All of this makes Europa a prime candidate for searching extraterrestrial life. But if we want to really see if there’s life on Europa, we need to send a lander mission there, and that’s not gonna be easy. A new paper published today in Nature Geoscience suggests that Europa’s jagged surface will make any landing mission even more difficult due to a phenomenon that’s also present on Earth: the so-called penitentes. 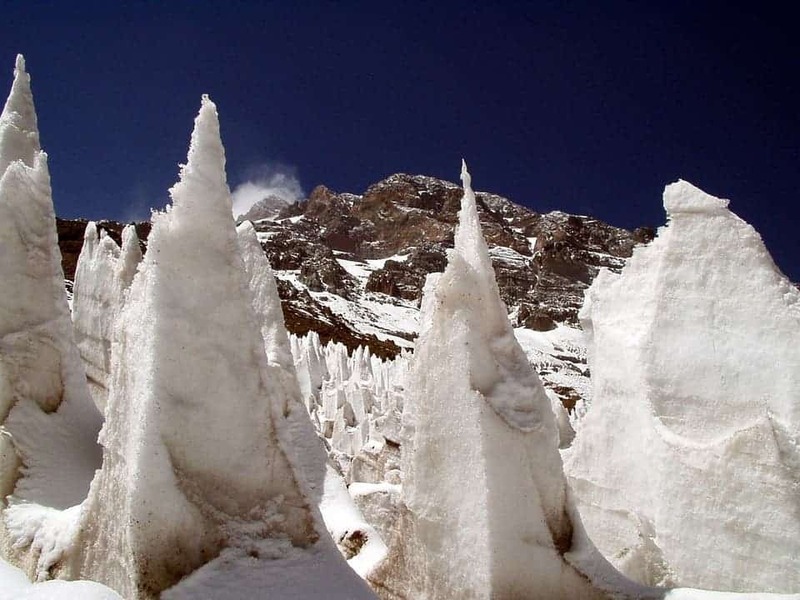 The penitentes were formally described by Charles Darwin in 1839: giant, blade-like ice features in the Andes mountains. When the weather is very dry and cold, the sun’s warm rays can cause parts of the ice and snow to undergo sublimation (turn from ice into vapour, without first becoming liquid). “On Earth, the sublimation of massive ice deposits at equatorial latitudes under cold and dry conditions in the absence of any liquid melt leads to the formation of spiked and bladed textures eroded into the surface of the ice. These sublimation-sculpted blades are known as penitentes,” researchers write in the study. A similar process has been observed on Pluto, for instance, so we know that it can happen on extraterrestrial bodies. Daniel Hobley of Cardiff University and his team investigated the conditions that could give rise to Penitentes on icy worlds such as Europa. They found that conditions on Europa favour the development of penitentes, particularly at latitudes below 23°, which in turn, could threaten potential future missions. “Although available images of Europa have insufficient resolution to detect surface roughness at the multi-metre scale, radar and thermal data are consistent with our interpretation. We suggest that penitentes could pose a hazard to a future lander on Europa,” the study concludes. Both NASA and ESA have Europa flyby missions scheduled for the 2020s.